Bakingproject.com will turn 5 years old this Feb, 10th ! I started writing this blog in 2008.. and alhamdulillah, still have something interesting to write here, now and then. Thank you to all the readers out there.. Anyway, I have some freebies to giveaway.. as usual, its a Lucky Draw. And these are the items, you can choose only one, ok.
All items above are provided by me except for item no. 2. This Silicone Baking Mold is sponsored by Wholeport. Heat-resistant temperature: -40C ~ +230C. Food-Grade (FDA Standard). Click on the pic below to visit their website. They are based in China but will post items to Malaysia. Loads of Baking Supplies to buy and reasonably priced, as well. 1. “Post to Facebook” by clicking the FB icon above this post. 2. Subscribe to my post, by filling in the form below (if you haven’t done so). 3. Leave the item number you wish, your name and email address in the comment section below. Comments section will be closed on 5TH FEB, 2013. I will announce the winners soon after that. Only open to Malaysians. Good luck ! Happy 5th Birthday Baking Project!! Salam kak min..happy 5th birthday..suka singgah sini dan baca resepi. Thanx ye..harap2 dpt item no 4.
blog kakmin is the best.. I wish for item no 4..
Congratulation & Happy 5th birthday Baking Project. Hi Yasmin, congrats on yr 5th baking project birthday. I am 60yrs old, taking up home baking as hobby… hope not to late to learn. Have run out of ideas on fondant deco. So would love no 4… . Semoga di murahkan rezeki Yasmin as you luv to share. Keep those emails coming, luv to read them. 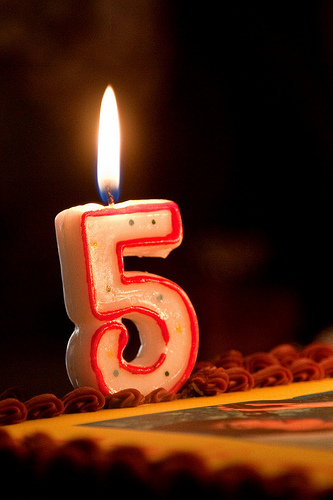 Happy 5th Birthday Baking Project! Congratulations Min, wishing u all the best in your future plans. Blog kak min menjadi rujukan… Happy 5th anniversary..
Love your site & blogs. Dont have any fondant or sugarcraft books, so would like no 4, please. Happy 5th anniversary, with many more to come. Just like you to know how much I have enjoyed reading your blogs and getting the recipes right every time. I am not expecting to win any prizes, just to convey my heartfelt thanks to you (and your crew) for all the lovely food and photos over the years. Even if I don’t get to try, at least I have enjoyed the pictures. Thank you again, May Allah grant you (and your crew), your family members good health, lots of rezeki (also ilham) in the years to come. Salam.. I pun suka no 5 juga..macam mana cara nak dapatkan nya? assalamua’laikum. wah, dah 5 tahun. Tahniah. Semoga terus maju bertapak-tapak. item numb. 1.. Hehe, buat untuk anak mesti dia minat bentuk2 macam ni. ada rezeki, insya’ALLAH, tak kemana, kan? I wish to have item No: 5…..
Assalamu’alaikum Min,saya suka item no.4 kerana dengarnya ada banyak kraf yang boleh dibentuk menggunakan fondant dan gum paste dalam buku tersebut dan saya pernah cuba buat homemade fondant Min (dari blog ini),cuma berani buat bunga dan reben kecil-kecil belum pernah lagi cover cake guna fondant(tahun ni insyaAllah-antara azam).Terima kasih. Happy 5th Birthday ! I wish to have no.4…. Thank you! happy 5th birthday to Baking Project!! harap2 dapat menang item no 5. I wish to get Item no. 2, thank you. Hello min, simply love your website especially your fondant icing and cake decorations. Your fondant icing handbags are super duper!!! Awesome creations and ideas, wish i was like you . Great ideas. what I like about you is your simplicity, honesty, generosity and sharing your your ideas and recipes with us, luv you for that. Hats off to you mate!! hope to meet you one day . Will attend one of your class , someday. Inspire us further , simply love it min!! Hallo Kak Min, Happy 5th Birthday to this blog..i am very excited to read your blog every time i received your blog announcement in my email..bought item no.4 last year & it would be great if i can have the item No. 1. Hi Kak Min, Happy birthday to bakingproject.com! Item number 4 would be great! Happy 5th Birthday to Baking Project (Kak Min). I would like to have no 4. Salam Min, Happy 5th Anniversary in advanced!! thanks for updating me of your interesting blog. Walaupun jauh di mata tapi Cikgu ku ini tetap dekat di hati…eheheh…teringin sgt nak dapatkan buku kek Min..cam mana nak order ye? Hi Min.. Saya suka resepi dalam blog kamu. Kalau dapat saya nak yang no. 4 tu. Great blog.Thanks for yoyr generosity to share your recipes.Have learnt a lot from your blog.Keep it up. Mas memang peminat Min Baking Project. Kerap juga mencuba resipi dari situ jika ada kelapangan. Sekiranya terpilih, Mas sukaaaa sgt utk memiliki item no 4, tak lain x bukan buku dari K Min. hehehe my birthday is on 5 Feb, hope could get birthday present from you! !